Old Viborg Town Hall is on the south side of Gammeltorv. It was built in 1728 by Master Builder Claus Stallknecht from Altona. Its interior decoration inspired many town halls in Denmark's market towns. The largest of Viborg town hall's rooms was the venue for public meetings, auctions, balls and parties, whereas the municipal authorities, town and district court, commission for the poor and other public offices were located in the side rooms. The basement housed the town gaol cells and madhouse as well as rooms for the town servants. The town fire engine was also parked here. Stallknecht's building remained the town hall until 1874. Then in 1889, the town museum moved into the stylish baroque building. 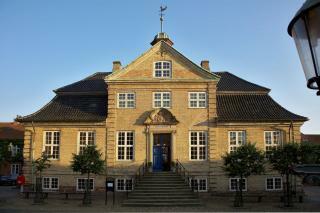 Since 1980, Skovgaard Museum has called it home. During the absolute monarchy, Viborg's citizens often celebrated the King's birthday with a ball at the town hall. The town newspaper described the event in 1819: Prefect Blom, Mayor Gundelach and his wife and other town dignitaries and fine folk, totalling 200 in all, attended in garments befitting their rank. The entrance door was decorated with the King's name and a crown surrounded by a wreath of oak leaves. At 7 o'clock the meal began with toasts to his Majesty to the sound of kettle drums, trumpets, cannons and the cheers of those gathered. A song, written by the mayor, secretary of the chancellery Gundelach, was sung. And then the high-spirited ball began and went on until eight the next morning. General happiness and public spirit characterised the whole party." "